For local tourist information, go to FieldwoodHeritageCentre on Facebook. This lighthouse was part of an effort to fight the decline of the once important seaport of Canning as steamships moved to larger and easier to navigate ports in the Minas Basin. Sir Frederick Borden, a powerful federal cabinet minister from Canning and cousin of Prime Minister Robert Borden, led the campaign for the lighthouse following the wreck of a coastal steamship the SS Edward Everett on the river's bank in 1893. Two 27 foot high tapered white "pepper pot" style lighthouses were constructed for Canning in 1904. One was at Porter Point, marking the mouth of the Habitant River which leads to Canning. The second was the Borden Wharf lighthouse which marked a sharp bend in the Habitant River half way up to Canning. 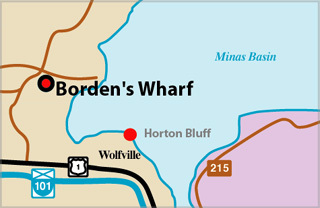 (The wharf and lighthouse were named after a neighboring farmer named William Borden.) Frederick Borden's political rivals derisively nicknamed it, "the lighthouse in the hayfield" because it seemed ludicrously far from the ocean. The Porter Point light remained in operation until the early 1960s when it was decommissioned and demolished, the lumber being used to build a nearby cottage. The Borden Wharf light was decommissioned in 1921 and sat abandoned until 1959 when the lower portion was moved a few hundred metres to a near-by farm to use as a pig shed. It was acquired by the Village of Canning in 1995, moved two kilometres upriver and half restored as tourism bureau. 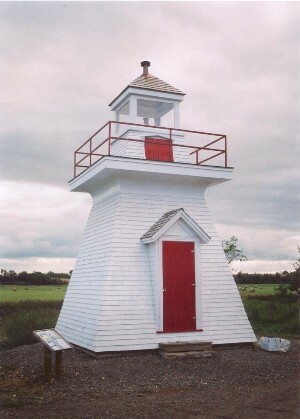 In 2003, the lighthouse was acquired by the Fieldwood Heritage Society and moved to the Canning waterfront, about 1.5 km for its original location, for full restoration with assistance from the NSLPS Kaplan fund. ACKNOWLEDGEMENT: Contributor: Dan Conlin. Sources: "Old Timers Canning and Habitant" by A. Marie Bickerton; List of Lights, 1912, 1926, Dept of Marine Annual Report 1922 and research files of Leon Barron.